Have you ever noticed how the moon looks bigger when it is on the horizon than it does when it is high in the sky? The moon often looks huge as it begins to peek up over the horizon, but hours later as you glance up into the night sky you will note that it now appears much smaller. This phenomenon is known as the moon illusion. While the moon illusion is well known through human history and culture, researchers are still debating explanations for why it happens. 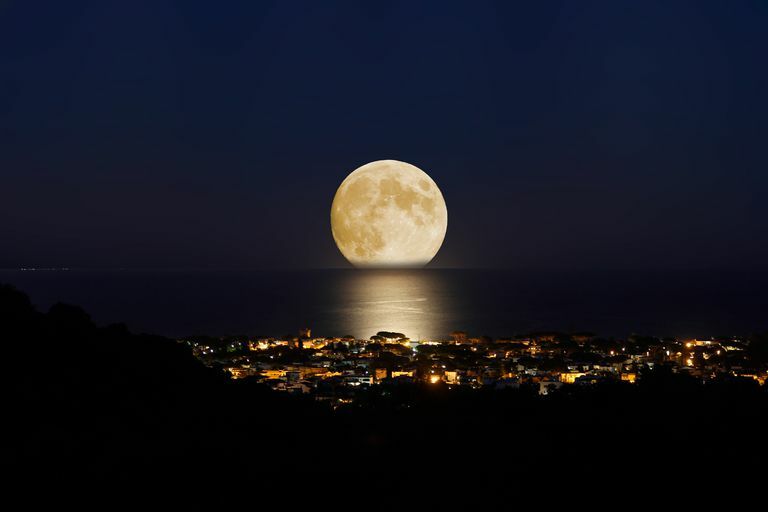 According to this possible explanation for the moon illusion, depth perception plays an important role in how we see the moon at the horizon versus high in the sky. This theory is centered on the idea that when you view the moon at the horizon, you are seeing it in the presence of depth cues such as trees, mountains, and other scenery. When the moon has moved higher into the sky, those depth cues disappear. Because of this, the apparent distance theory suggests, we tend to see the moon as further away on the horizon than we see it when it elevated in the sky. Researchers have found evidence supporting the apparent distance explanation. In one experiment, participants perceived the moon as farther away and 1.3 times larger when it was viewed over natural terrain. Experimenters then masked off the terrain by having participants view the moon through a hole in a piece of cardboard, which caused the moon illusion to vanish. This explanation focuses instead on the visual angle of the moon in comparison to surrounding objects. When the moon is on the horizon and surrounded by smaller objects, it appears larger. At its zenith, the moon appears much smaller because it is surrounded by the large expanse of the sky. Color: When the moon appears red (due to smoke or dust in the air), it appears larger. Those who live in rural areas may notice this effect during harvest season when the horizon is often clouded with dust and other particulates. Atmospheric Perspective: When it is hazy or smoky outside, the moon appears larger on the horizon. After a forest fire or on a day when it seems particularly smoggy, you might notice that the moon illusion seems more pronounced. Visual Factors: Convergence of the eyes when viewing things on the horizon also causes objects to appear larger. As with other visual phenomena, it is possible that no single variable can adequately explain the moon illusion. Instead, it is possible that many different factors might play a role. Baird, J. C., Wagner, M., & Fuld, K. (1990). A Simple But Powerful Theory of the Moon Illusion. Journal of Experimental Psychology: Human Perception and Performance, 16, 675-677. Kaufman, L., & Rock, I. (1962). The Moon Illusion. Science, 136, 953-961. Kaufman, L., & Rock, I. (1962). The Moon Illusion. Scientific American, 207, 120-132. Plug, C., & Ross, H. E. (1994). The Natural Moon Illusion: A Multifactor Account. Perception, 23,321-333. Why Do People Blame the Victim? What Are Afterimages and Why Do They Happen?